The neighborhood rabbits will like it if you frame your vegetable garden with a couple of these corner accent fences. The kit comes complete with post caps to decorate the posts. Even if you don’t have a garden, you probably have a spot that this L-shaped vinyl fence could accent. So easy to put together. 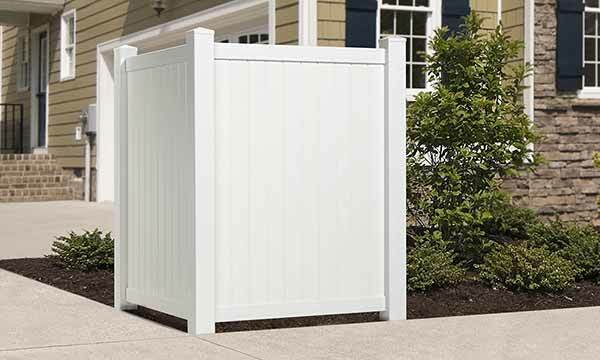 Picket fence kit pieces slide together and lock in place without hardware or glue. No posts to bury. Fence can sit on top of concrete, or, you can secure it to the ground with included stakes (they go inside the posts). So easy to clean – just hose it down. Quality PVC vinyl is manufactured to withstand UV rays and normal temperature fluctuations. It eliminates the weatherproofing nonsense that ruins your day off.